Civic clubs, volunteer organizations, and community service groups use wood rulers as a thank you to help recruit volunteers, and imprint them with general reminders such as "Make it a Rule to Volunteer". "Make It a Rule to Call..."
"Our Steadfast Rule - Quality First"
"We're with You Every Inch of the Way!" "You'll Get Things Straight From..."
"Rule out (drugs, crime, smoking, etc.)" "It's a Good Rule to Deal with..."
Our wooden rulers are available in 6" and 12" lengths. Imprint colors available are black, red, light blue, dark blue, green, brown, orange, maroon or purple; however, black is recommended. Our Wood Rulers are proudly made in the USA. Classic beveled design with clear lacquer finish. English scale. Ruler is 5/32"x7/8"x6". Maximum logo height is 3/8". Popular 6" ruler in natural wood finish. English scale. Ruler is 1/8"x7/8"x6". Maximum logo height is 3/8". Natural wood finish. English scale. 5/32"x1-1/8"x6". Maximum logo height is 1/2". For 6" rulers, pricing includes straight-line ad copy printed in one color on one side. An additional $55 non-refundable artwork/proof charge per color must be paid before work can begin. Since a paper product proof is provided on our wooden rulers, any changes requested after first proof will require additional $50 proof charge. For logo or special typestyle, add $30 per color (for every 3" in length). Contact us for second side or multi-color imprint. Real estate and insurance agents frequently use 12 inch wooden rulers as a business card. It's an inexpensive, long lasting reminder of the services they offer. This natural wood finish ruler is a great value. English or metric scale available (English is used unless otherwise specified). 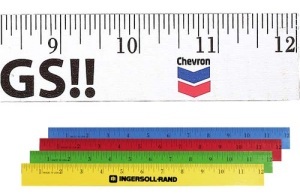 The 12 inch ruler is 1/8"x7/8"x12". Maximum logo height is 3/8". Best selling 12" ruler! Natural wood finish. English or metric scale available (English is used unless otherwise specified). Ruler is 5/32"x1-1/8"x12". Maximum logo height is 1/2". Natural wood finish. This 12 inch ruler is printed with both the English and metric scales. 5/32"x1-1/8"x12". Maximum logo height is 1/4". Enamel rulers come in assorted colors of red, blue, yellow, green and white (unless otherwise specified) with a black imprint. English scale. Ruler is 5/32"x1-1/8"x12". Maximum logo height is 1/2". For 12" rulers, pricing includes 40 characters and spaces on one side in one color. An additional $55 non-refundable artwork/proof charge per color must be paid before work can begin. Since a paper product proof is provided on our wooden rulers, any changes requested after first proof will require additional $50 proof charge. For logo or special typestyle, add $30 per color (for every 3" in length). Contact us for second side or multi-color imprint. Name identification can be increased by offering a useful item such as our wooden rulers. If people see your name on a repetitive basis, they soon learn your name and become familiar with it. After becoming familiar with your name, and you have the high recall in their mind, they become comfortable voting for you or doing business with you. People do not feel comfortable voting for a stranger. Increasing your Name Identification -- the most important purpose of a political advertising campaign. Custom printed wooden rulers, a product they will want to keep, and your name will be deeply impressed in their mind for many occasions to come. Wooden Yardsticks - Be sure to check out our wooden yardsticks too. In addition we offer many other personalized tools; including flashlights, box cutters, tool sets and even carpenter pencils.